Mona Lisa (also known as La Gioconda or La Joconde) is a 16th-century portrait painted in oil by Leonardo da Vinci during the Renaissance in Florence, Italy. Many people think Mona Lisa's smile is mysterious. It is so often studied, recognized, and copied that it is the most famous painting . The Louvre says that about 80 percent of its visitors come to see the painting of Mona Lisa. The painting is owned by the Government of France and is shown at the Musée du Louvre in Paris under the title Portrait of Lisa Gherardini, wife of Francesco del Giocondo. Giorgio Vasari, who was Leonardo's first biographer (a person who writes about the life of another person), thought the painting was of a person named Lisa Gherardini. Speculation over the painting's model was solved in 2008 by Dr Armin Schlechter, a manuscript expert. Notes discovered in Heidelberg University Library which were written by Agostino Vespucci, a Florentine city official, reinforced Vasari's earlier identification of the model. Lisa was the wife of Francesco del Giocondo a rich silk merchant, who lived in Florence. 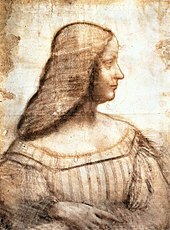 Although the sitter has traditionally been identified as Lisa del Giocondo, a lack of definitive evidence has long fueled alternative theories, including Leonardo's mother Caterina in a distant memory as the painting's subject and the possibility that Leonardo used his own likeness. Leonardo began painting the Mona Lisa in 1503 or 1504 in Florence, Italy. According to Da Vinci's contemporary, Giorgio Vasari, "...after he had lingered over it four years, left it unfinished....". The painting was brought to France by Leonardo in 1516 and it was bought by Francis I of France. The Mona Lisa used to hang in the Chateau Fontainebleau and was then moved to the Palace of Versailles. After the French Revolution, Napoleon I of France had it hanging in his bedroom in the Tuileries Palace, but it was later moved to the Louvre where it is still hanging today. On August 21, 1911, the Mona Lisa was stolen. The Louvre museum thought it was being photographed, but when they checked, it was not there. The Louvre closed for one week to help look for it. People thought Guillaume Apollinaire, a French poet, stole it. He was put into jail, and tried to make people think his friend Pablo Picasso did it, and he was questioned. It was not either of them, though. It was lost for two years, and everybody thought it would be lost forever. A worker at the Louvre, named Vincenzo Peruggia, had actually stolen it. He had hidden it in his coat and walked out with it after the museum had closed. He wanted the painting to go back to Italy and be shown in an Italian museum. After hiding it in his apartment for two years, he grew impatient and tried to sell it to a gallery in Florence, but was caught. It was shown all over Italy before going back to the Louvre. People thought Vincenzo was a hero who loved Italy, so he only spent a few months in jail. ↑ "Noisy secret of Mona Lisa's smile - 23 June 2004 - New Scientist". newscientist.com. Retrieved 4 January 2011. ↑ Charles Donald O'Malley, Leonardo's legacy: an international symposium, University of California Press, 1969, p.121. ↑ 4.0 4.1 "The New York Times > Arts > Art & Design > In Louvre, New Room With View of 'Mona Lisa'". nytimes.com. Retrieved 4 January 2011. ↑ "Portrait of Lisa Gherardini, wife of Francesco del Giocondo". Musée du Louvre. Retrieved 2008-04-27. ↑ Wiesner-Hanks, Merry E. (2005). An Age of Voyages, 1350-1600. Oxford University Press, USA. p. 26. ISBN 978-0-19-517672-8. This page was last changed on 6 April 2019, at 13:38.